"For a cold night or if you have a cold! 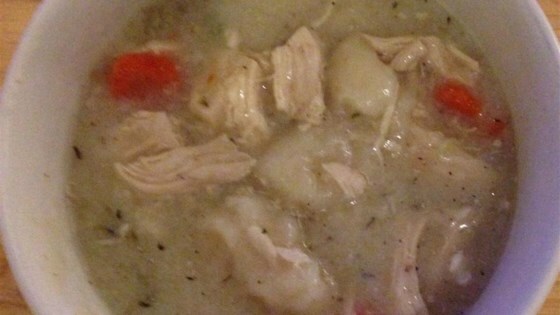 My mom's Southern chicken and dumplings simplified with biscuit dough (preservative-free!) and boned chicken. It's also healthier with skinless chicken and added mirepoix. Adjust seasonings as necessary." Combine water, carrots, onion, celery, thyme, rosemary, salt, and black pepper in a large pot; bring to a boil. Reduce heat and simmer until vegetables are tender, about 15 minutes. Add chicken to soup and cook until no longer pink in the center, about 10 minutes. Drop biscuit pieces into soup and cook until dumplings are cooked through, 10 to 20 minutes. See how to make hearty chicken noodle soup in just 30 minutes. If you have time, you can make whole wheat dough in the bread maker and use part of it instead of the biscuit dough. Chicken stock can be substituted for water if desired. Wow, way too much seasoning. Thankfully I tasted it before I added the chicken. I double checked the recipe and I made it exactly . Sorry, it's a no for me. I used chicken thighs and browned them first. I only used celery, onions, and poultry seasoning, besides salt and pepper.